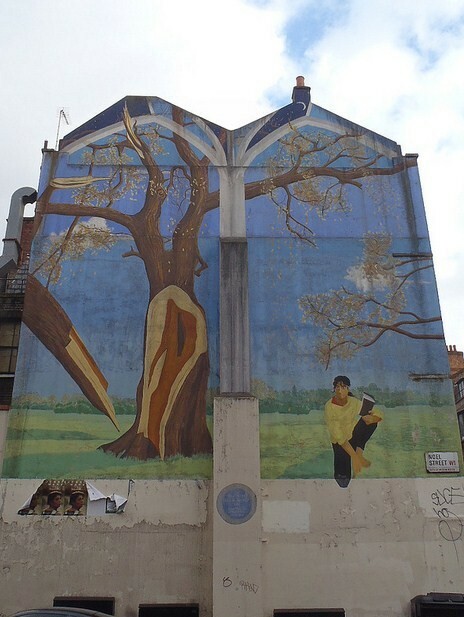 Found on the corner of Noel Street and Poland Street in Soho is a mural titled Ode to the West Wind, painted in 1989 by the London Wall Mural Group, led by artist Louise Vines. The mural's title refers to a poem Ode to the West Wind, written by Poland Street resident Percy Bysshe Shelley in 1819. We are told that Shelley lived for a while at 15 Poland Street, hence the location of the mural.